After trip,the thing i interested is Baba-Nyonya. One of Malacca’s most distinctive attractions is none other than the Peranakan or Straits Chinese, Chinese migrants who intermarried with the locals and settled here during the early 1400s. The men came to be known as Baba, while the women are referred to as Nyonya. Malay influence is very strong in their clothing and food, but they have also retained their Chinese heritage, especially their religion, name and ethnic identity. Over time, they assimilated Malay language and customs into their lives, and created a fusion culture of their own.They were usually traders, the middleman of the British and the Chinese, or the Chinese and Malays, or vice versa due to the fact that they were mostly English educated. Because of this, they almost always had the ability to speak two or more languages. In later generations, some lost the ability to speak Chinese as they became assimilated to the Malay Peninsula's culture and started to speak Malay fluently as a first or second language. The language of the Peranakans, Baba Malay, is a creole dialect of the Malay language, which contains many Hokkien words. It is a dying language, and its contemporary use is mainly limited to members of the older generation. English has now replaced this as the main language spoken amongst the younger generation. The Peranakan retained most of their ethnic and religious origins (such as ancestor worship), but assimilated the language and culture of the Malays. 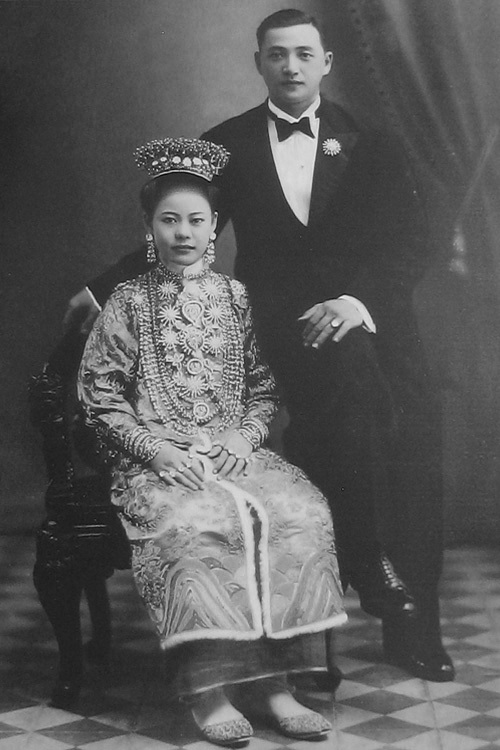 The Nyonya's clothing, Baju Panjang (Long Dress) was adapted from the native Malay's Baju Kurung. While Nyonya food contains many of the traditional ingredients of Chinese food and Malay spices and herbs, Nyonya cuisine is eclectically seasoned and different than either Chinese or Malay food. It is fusion cuisine at it's best! As in Malay cooking, a key ingredient in Nyonya cuisine is Belacan pronounced blah-chan - a dried shrimp paste. It's commonly in the form of a pressed brick or cake. Nyonya food originating from the North of Malaysia - Penang, and Nyonya food originating from the South - Malacca and Singapore, have distinct differences. Nyonya cuisine is also famous for it's Kuih (cake or dessert). Nyonya desserts are varied and extraordinary. They are strongly Malay influenced - made from local ingredients such as sweet potato, yams, agar agar, gula Melaka (palm sugar), coconut milk, glutinous rice - and Chinese ingredients such as red beans, green beans or mung beans.